Last week, Avital turned 4. She has been asking for a bee suit, so I finally bought her one. Yes, they make them for children! It’s still a bit big on her, but she’ll grow into it. I keep a nuc and a full size hive in the backyard. Yesterday, we suited up and headed out with hive tools and smoker in hand(s). I wore my jacket with attached veil, khaki painters pants, and sandals. Avital wore her new suit and sandals. I wear sandals unless the particular yard has a lot of wild roses or thorny berries growing around it; then I wear rain boots to protect my feet from thorns. I have yet to take a sting on the foot. I let Avital wear her sandals because I knew we wouldn’t be tearing the colonies apart, and on a 90F+ day, having her in a full suit already was pretty hot. I wanted to do a quick check of a few frames, and start teaching her some beeyard etiquette. Neither of us wore gloves. I never do, unless a hive is really ornery, which has only happened once in 8 years. I decided not to bother with the children’s gloves for Avital; they would be so huge as to be useless, and I wanted her to actually feel the wood and wax, and perhaps pick up a passing drone. That’s Avital, a few months ago, wearing no protective gear, standing next to a hive. The picture tells us something about bees, and something about Avital. Avital likes bees. She isn’t afraid of them, and she is not reckless by nature. So I don’t worry about her being near the bees. The bees, of course, are the other half of the equation. Do I worry about the bees being around her? No. Especially in my home apiary, I make sure my bees are gentle. 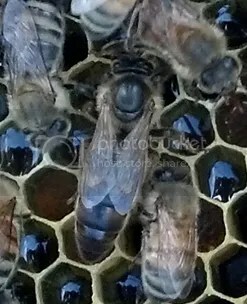 They are not defensive, and will not come after a person or animal near the hive, or even a beekeeper opening the hive. My biggest worry when I took that picture was that a stray breeze would blow a returning worker into Avital’s hair. A bee tangled in hair is hard to remove, and will sting! Let’s talk about stings. I work with bees and I get stung. The vast majority of the time, I get stung because I put my finger down on a bee, or a bee gets trapped under my clothing (the elastic on my jacket’s sleeves went a long time ago). I nearly always wear a veil to protect my face, but when I’m working an apiary in nearly 100F degree weather, I skip the jacket for regular hive checks. It isn’t worth the risk of heat stroke. When I’m stung, it hurts, obviously, but not for more than (I’ve never timed it…) a few seconds. Half a minute. In any case, I’m usually in the middle of something, and too busy to worry about it. Most beekeepers’ bodies get used to stings, and don’t swell up much at all from them. For whatever reason, my body never has responded to them. Often, within an hour, I can’t even tell where I’ve been stung. Avital has been stung twice. Once when she was about 2. A dying worker bee had made its way to our patio. She picked it up, and it stung her finger. She said, “Oh!” I scraped the stinger out, and we went on our merry way. She didn’t cry, and her finger had a small swelling the size of a pea on it. The second time was a few weeks ago, when she and David came with me to move the hives on the Wixom farm. She wore a skirt that day (not a great idea around bees, since a bee trapped under clothing will eventually sting out of panic) and was stung on the leg. This time, she had a slightly larger swelling, but no apparent pain past the initial sting. The incident didn’t bother her in the least; she still wanted a bee suit, and she still wanted to help with bees. There’s a lot more that I can say about stings, but the bottom line is this: European honey bees are not aggressive. A single sting will cause discomfort and a bit of swelling in the vast majority of people, but it’s not a big deal. If you have a localized reaction to the sting (you’re stung on the finger, and the finger, hand, or even arm swells up), you aren’t allergic to honey bee stings. If you’re stung on the finger, and you get hives on your chest, or your leg, or your throat wells up, or something other than localized swelling, see an allergist. That’s a systemic reaction, and you should probably carry an Epi pen. And not keep bees. Oh, and don’t take medical advice from blogs on the Internet. So–lecture over! But if you have questions, please email me, or leave a comment below. Avital’s first lesson in hive etiquette was this: always stand to one side of the hive, or behind it. If you stand in front of it, returning foragers can’t get inside, and a cloud of bees accumulates in front of the entrance. Avital collected sticks to light the smoker, but I took care of the lighting part! She did help to puff smoke into the entrance to calm the bees, and pry the frames apart so that I could remove one. The second lesson in etiquette is to use enough smoke, but not too much, and move smoothly and confidently. Rough, jerky movements are much more likely to upset the bees. 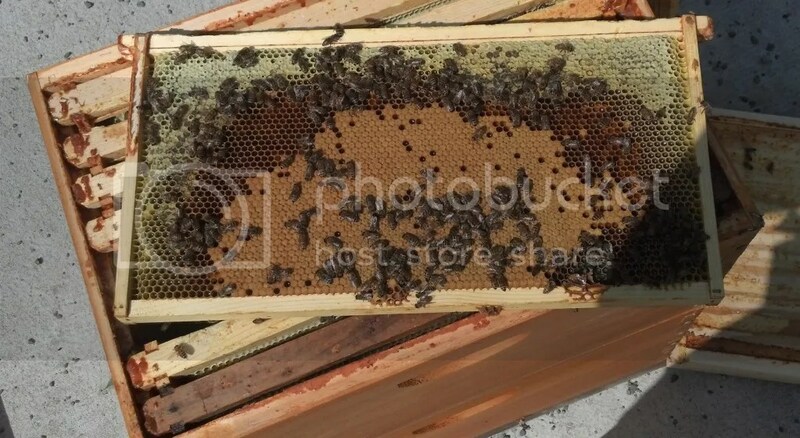 I removed the frame (full of honey, they can be surprisingly heavy, about 5 lbs each), and together we examined a frame of brood and honey, so that she could learn the difference between capped brood, and capped honey. The cells with dark tan cappings are brood cells. The cappings have a fair amount of propolis in them, which makes them dark. The cappings also “breathe,” as you might expect. 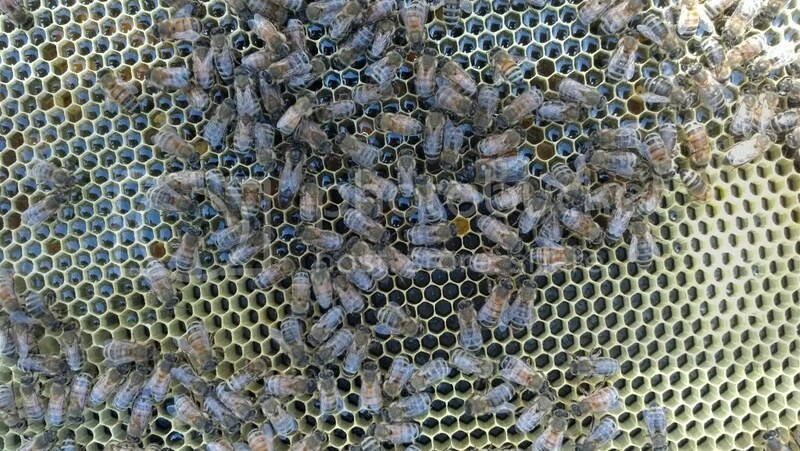 The honey cappings are on the top edges of the frame, light in color, and nearly air tight. 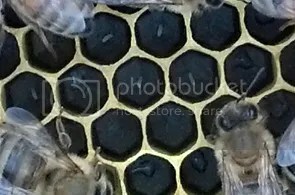 This is a pretty nice frame of brood, with the classic arc of tan cappings surrounded by cells of pollen (mostly gone at this point, used to feed the larvae before the cells were capped, but you can see some orange pollen in cells to the right of the brood), and above that, cells of honey. Here is a close up of bee eggs–see how small they are? We found the queen in the nuc, and watched her scurry around the frame. Can you spot the queen on the frame below? That is a drone–notice how different his body is from the workers’ and queen’s. It’s bullet shaped and blunt, and his eyes are very large. He also has a parasitic varroa mite on his back. That’s bad news. That means I have to go back out to this hive and check for mites (which ought to be done monthly, in any case). Avital was curious, careful, fearless, but not reckless. I think she’s going to make a great beekeeper!